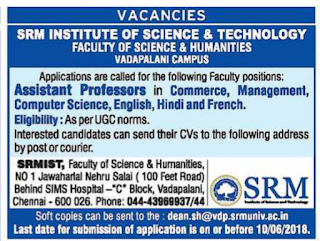 SRM Institute of Science and technology, Vadapalani, has advertised in the HINDU newspaper for recruitment of Assistant Professor jobs vacancies. Interested and eligible job aspirants are requested to apply on or before 10.06.2018. Check out further more details below. About College:SRM Institute of Science and Technology (formerly known as SRM University) - where you have the freedom to take wings. 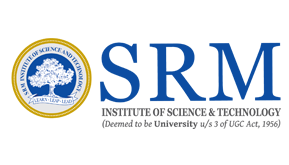 SRM Institute of Science and Technology (formerly known as SRM University) is one of the top ranking universities in India with over 20,000 students and 1,500 faculty, offering a wide range of undergraduate, postgraduate and doctoral programs in Engineering, Management, Medicine and Health sciences, and Science and Humanities. How to apply: Interested and eligible candidates can send their CVs to the following address by post or courier. Last date to send on or before 10.06.2018.